Milestone in Math. Thank you to our teachers for pulling this together! When: Friday, May 10th from 6:00-9:00 P.M.
8th Grade Student at Marietta Middle School (Students from other grades or schools cannot attend). Create a plan to be picked up no later than 9:00 p.m. Dresses and skirts of appropriate length and design. Dress shirts, dress pants, button-up shirts, slacks, and khakis. Please no jeans, t-shirts, or shorts. If you have a question about the outfit you want to wear, take a picture of it and show your teacher or Mr. Booker. Applications can be picked up at the office! Honors Night will be on May 20th at 6:30pm at Turner Chapel. Invitations will be sent home. Yearbooks are still on sale, get yours while they're available. Currently, they are at $35. Follow the link to purchase your yearbook! Packets or payment must be turned in at the front office. The inaugural Marietta Community Egg Hunt will be April 19th from 5 to 9 p.m. at the Marietta High School practice fields behind the school at 1171 Whitlock Avenue NW in Marietta. There will food, games, music, activities, egg hunts and the giant Superior Plumbing and Zaxby’s hot air balloons. Egg hunts will start at 5:30 p.m. for ages three and under, a special needs hunt at 6 p.m., ages 4-7 at 7 p.m., another special needs hunt at 8 p.m. and ages 8-10 at 8:30 p.m. Toddler hunts will be in a separate area at 5:30, 7 and 8:30 p.m. There will be a Kid’s Zone with unlimited rides for $7 per child. For more information, call 770-423-1330, e-mail billwatson@jrmmanagement.com or visit www.mariettaegghunt.com. 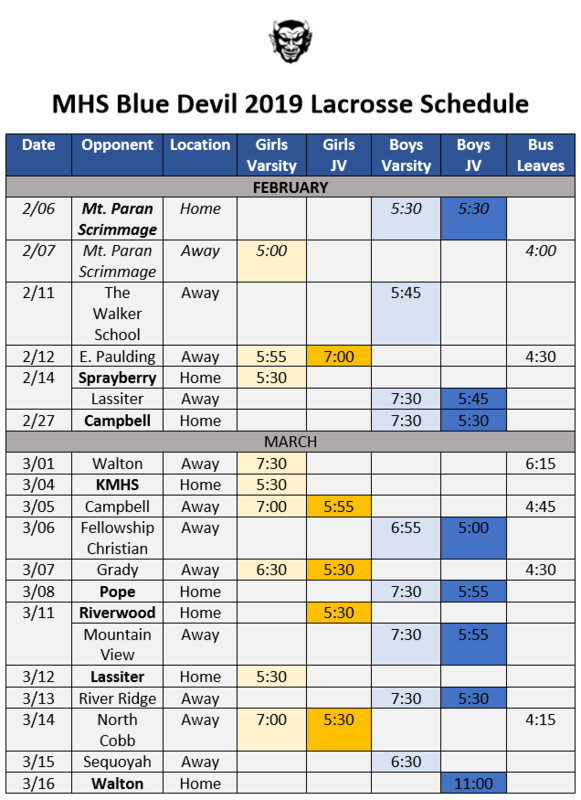 Please fill out the form if you plan to attend tryouts for Marietta Middle School! Tryouts will be held May 6-8 from 4:30-6:30 PM in the main gym at Marietta Middle School. We will make 2 teams, any players who do not make a team are encouraged to participate in our fall ball development program. community members and learn about their career choices. Milestones start THIS WEDNESDAY, April 17th. Georgia Milestones End of Grade Assessment is designed to provide information about how well students are mastering the state adopted content standards in the core content areas of English Language Arts, Mathematics, Science, and Social Studies. Importantly, Georgia Milestones is designed to provide students with critical information about their own achievement and their readiness for their next level of learning—be it the next grade, the next course, or the next endeavor (college or career). MMS students will be taking the EOG assessments beginning APRIL 17th. Resources are available for both parents and students. Students have the ability to explore the features of the exam by visiting www.gaexperienceonline.com . Study guides are also available. Spring Pictures will be sent home next week. Packets or payment must be turned in at the front office. P.S. Can't make the meeting? Want more information? RSVP with the link below and select "I can't make it". 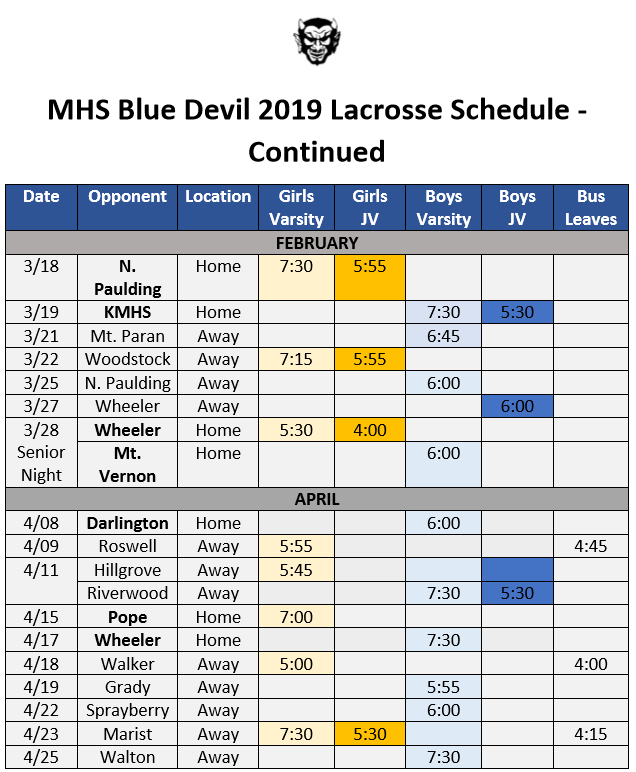 Join Craig McKinney, MCS Director of Athletics, for an informative evening on the Mission and Structure of Athletics in the Marietta City School District on Thursday, April 18, 2019 in the MHS Seminar Room at 7:00PM. 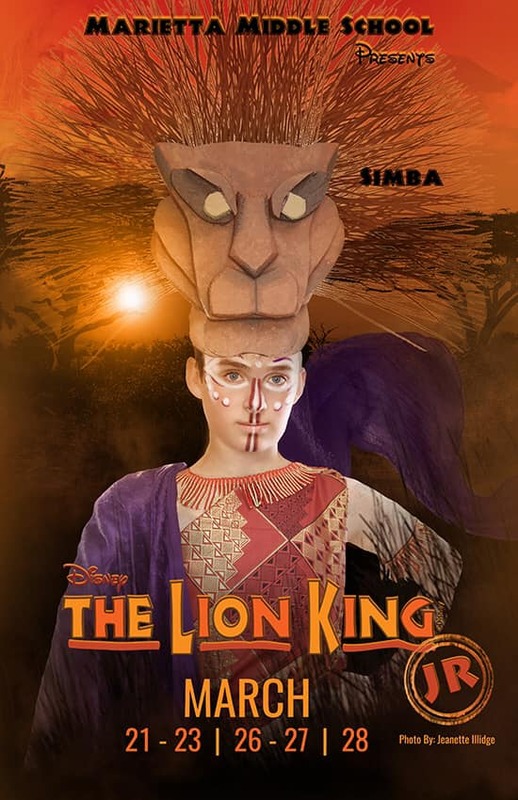 Our wonderful run of The Lion King Jr! Congratulations to all the performers for their great job! Georgia Milestones End of Grade Assessment is designed to provide information about how well students are mastering the state adopted content standards in the core content areas of English Language Arts, Mathematics, Science, and Social Studies. Importantly, Georgia Milestones is designed to provide students with critical information about their own achievement and their readiness for their next level of learning—be it the next grade, the next course, or the next endeavor (college or career). MMS students will be taking the EOG assessments beginning April 17. Marietta Middle School is excited to offer Studio Visual Art class to qualifying students. This course will encompass the following topics: art awareness, art criticism, art history, ceramics, drawing, painting, multi-media and sculpture. This is a year-long course for art students with further opportunities to grow their talents through an individualized study. Interested students must submit a photograph of an artwork though the link provided and complete the MMS Studio Visual Arts. As part of the application, students will be required to include a short description of why they should be considered for this course as well as a photograph of an original artwork. This artwork should be a recent example from a school project or completed independently. Please save your picture using your full name. All applications are due by Friday, April 12, 2019. 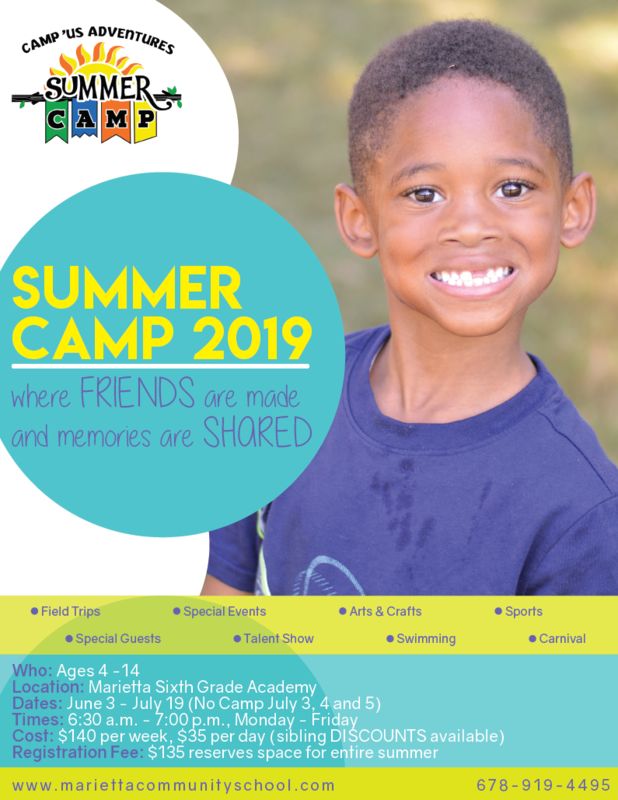 Please forward any questions to Mrs. Northcutt at mnorthcutt@marietta-city.k12.ga.us or Mrs. Arrington-Hagood at aarrington@marietta-city.k12.ga.us. Students accepted into Studio Visual Art must demonstrated exceptional potential in Visual Arts. This course will require hard work and extraordinary commitment and dedication. Please note that student placement in yearlong elective courses such as Studio Visual Art can be impacted by student's academic need (take priority) and seat availability. Aloha and Mahalo! Aloha Friday is on the horizon! Friday, April 12, 2019 from 6-8 pm, we will have a Spring Luau at MMS. The Spring Luau Dance will be in the MMS Cafeteria. Tickets only cost $5 and refreshments will be served at the dance. There will be a “How Low Can You Go?” limbo contest and door prizes. DJ Babyface will be on the 1s and 2s. The attire for the dance is Dress to Impress or Hawaiian attire! Students will need to be picked up no later than 8PM the night of the dance. Eighth grade students who are interested in taking Health next year need to complete the registration link at http://bit.ly/FY20Health by April 12, 2019. Students will take the Health course as part of their PE/Health offering. Students will report to the Health classroom during their regular scheduled PE class. The Health class for 0.5 high school credit is offered through an online format and covers the Georgia Performance Standards for 9-12 Health. The 7th and 8th grade symphonic bands performed at LGPE (Large Group Performance Evaluation the past two days at McEachern High School. Both groups earned some of the highest scores for our school ever. Eighth grade earned an overall Superior; seventh grade earned the highest marks possible, straight Superiors! While students had a few months to prepare for the concert portions, students also had to perform a sight-reading evaluation. Overall, our bands received complements on how well we played and were thanked by many on how polite and respectful our students were. We are proud of their hard work and how well they represented MMS and the system! Gabby Kern (7th) & Nicole Munoz (8th) won first place in their divisions for the Kiwanis Art Showcase. These girls created their original piece of art at home using the medium, style, and subject matter of their choice. Congratulations to these two young ladies for their hard work and accomplishment! 7th grade orchestra received a rating of superior from all 3 judges and a superior in sight reading as well. 8th grade orchestra received an overall rating of excellent (2 excellents and 1 superior) and a superior in sight reading. Congratulations to those hard-working students for their great outcomes! united for their performance at Charleston. Your child now has a Library PASS with the Cobb County Public Library System. They can now access free resources and databases 24/7 to help with their homework or projects. For more information about their Library PASS and how to use it, please visit one of the 16 Cobb County Public Library locations or visit them online at cobbcat.org/librarypass. If you missed the first show, don't worry, there are more opportunities to join the pride! 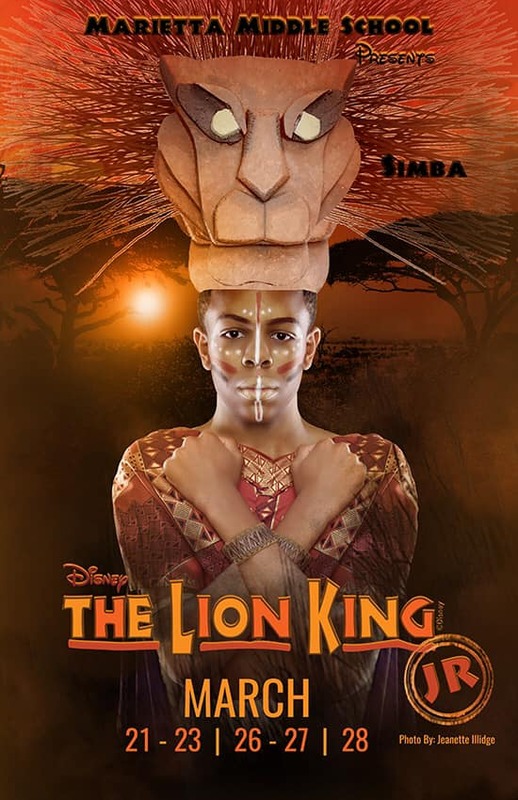 Buy your tickets for The Lion King Jr!